In a large stockpot or turkey fryer, heat oil to 400 degrees F (200 degrees C). Be sure to leave room for the turkey, or the oil will spill over. Layer a large platter with food-safe paper bags. Rinse turkey, and thoroughly pat dry with paper towels. Rub Creole seasoning over turkey inside and out. Make sure the hole at the neck is open at least 2 inches so the oil can flow freely through the bird. Place the whole onion and turkey in drain basket. 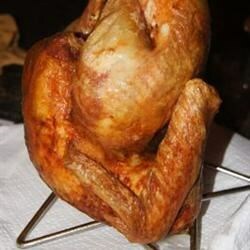 The turkey should be placed in basket neck end first. Slowly lower basket into hot oil to completely cover turkey. Maintain the temperature of the oil at 350 degrees F (175 degrees C), and cook turkey for 3 1/2 minutes per pound, about 45 minutes. Carefully remove basket from oil, and drain turkey. Insert a meat thermometer into the thickest part of the thigh; the internal temperature must be 180 degrees F (80 degrees C). Finish draining turkey on the prepared platter. This marinade makes a tasty, moist, flavorful bird. We have determined the nutritional value of oil for frying based on a retention value of 1% after cooking. The exact amount may vary depending on cook time and temperature, ingredient density, and the specific type of oil used. Very different. My oil pot was not large enough. My husband loved it, I found it dull. The kids thought it was "cool". By the time the inside was cooked, the outside was too dry for me. In South Carolina, where your turkey frying skills are as important as important as what church you attend, this one wins every time! Great recipe.